When a heartbroken father confronted the police officer who killed his son, the officer claimed he would shoot the unarmed young man again in the same situation. 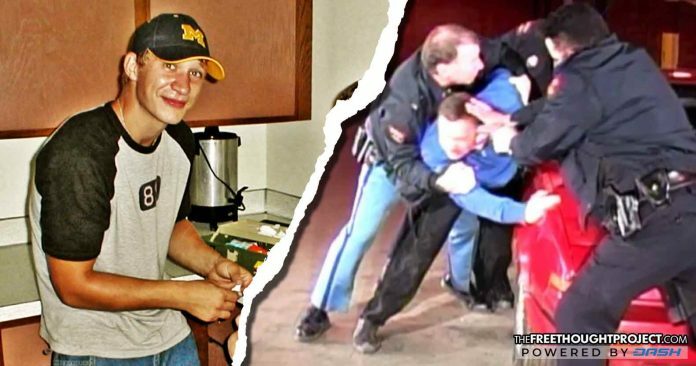 Kenosha, Wisconsin – A grieving father who has spent more than 13 years searching for answers in the case of his son’s tragic death, is now releasing the footage from a confrontation with the police officer who shot and killed him. Michael Bell Sr. told The Free Thought Project that he started out by taking a metal driveway sign his son made in his high school shop class and a picture of the young man and placing them on the front porch of the officer who killed him during a traffic stop in 2004. Bell said he did not have to go out of his way to find Kenosha Police Officer Alberto Gonzalez. In fact, following the shooting, Gonzalez bought the house right beside Bell’s in-laws, which the grieving father felt was just another proverbial slap in the face. However, the officer did not appreciate the gift. The father waited nine years before confronting Gonzalez face-to-face in 2013, following a police commission forum for an investigation into whether the department influenced the results of an officer-involved Taser incident. Many officers addressed Bell, with one even saying that his son would still be alive today if Bell had been “a better father.” Following the meeting, Gonzalez approached Bell and engaged in a conversation which, until today, has never been released to the public. “I’m asking for change… I’m asking for an independent review of the situation… And that’s what I’m looking for. I know what happened,” Bell told Gonzalez, referencing the tragic night his son was killed in 2004. To this day, Bell, as well as many legal experts, believe Kenosha Police needlessly escalated the use of force on his son which led to one officer claiming the young man had taken his gun. Then, an order was given to shoot Michael Bell Jr. in the head—an order Gonzalez carried out. In the video, Gonzalez did not wish to discuss his knowledge of any cover-up but said that since the night he killed Michael he has been praying for Kim and Shante, Michael’s mother and sister. Both women, who witnessed the shooting, say the officers lied about Michael having taken one officer’s gun and are still lying about what happened. During the exchange with Gonzalez, Bell appealed to the officer’s sense of justice and asked him to join him in calling for change. “I understand. I want change. Stand up and ask for change,” he said. “Because there was nothing that was done… or nothing was done to your family as trying to hide anything, sir,” Gonzalez interrupted. That is when the tone took a different direction in the confrontation between a cop and the man whose son he killed. “You know as well as I do, you were standing on the right side of my son when you killed him,” Bell said. Gonzalez harkened back to his contention that the department did not cover-up details of the killing. “And now you have the truth. You know the truth, Mr. Bell,” he said. It is unclear as to which truth Gonzalez was referring. Minutes earlier, a Kenosha Police Detective’s version of the truth painted Michael Bell Jr. as a bad kid whose father should have been a better parent. Moments later, the officer who killed Michael told his father that he knows the truth. Eric Strausbaugh was the officer who erroneously proclaimed that Michael had taken his gun. Strausbaugh later killed himself, reportedly grieving over his role in the shooting and rumors of an impending investigation. Bell’s comments about his partner turned up the heat in the contentious conversation. Bell believes, as do forensics experts, that not only did his son not have Straubaugh’s gun but the gun was likely caught on the driver’s side mirror, shifting the gun from its usual position, causing the officer to mistakenly cry out that his gun was in Michael’s hand. Many people would argue that Bell was much more composed than most angry and grieving parents would likely have been. When Gonzalez could only reply, “that’s a shame sir,” Bell continued. “You absolutely know it because there are four people who sat right there and watched it!” Bell said, referring to his ex-wife, his daughter, and two neighbors, who all witnessed the shooting. The denial of responsibility likely turned up the heat even more with Bell then calling into question Gonzalez’ and the other Kenosha Police officers’ recollection of events on that fateful night in question. In a sworn deposition, Gonzalez stated that he was on Bell’s left side when he shot him in the head but forensics would later determine the shots must have come from Michael’s right side. The officer forgiving Bell did not and does not sit well with the grieving father. In the father’s eyes, it was not Bell who needed to be forgiven. Throughout the entire conversation, Gonzalez stopped short of an apology. Bell offered forgiveness to Gonzalez. Gonzalez then asked Bell to keep the conversation he was having between the two of them—something Bell, obviously, did not agree to do. “You came to my house. You crossed the line. You admitted it. You affected my family,” Gonzalez said. Bell reminded Gonzalez it was done on the anniversary of his son’s death and that he was greiving. “I wanted to show you what you took from me,” he said. Gonzalez then revealed what many critics of modern-day policing believe—that police officers equate the public as the enemy and themselves as the good guys. “If the enemy came to your house and did something to you for what you had done to them. It’s not that your son was the enemy. You understand in the context I’m saying it, you wouldn’t appreciate it,” he said. Bell reminded Gonzalez that he has received death threats for daring to question the police but reiterated his national goals to the man who killed his son. Following the deadly shooting, all of the Kenosha Police officers involved in the killing of Bell Jr. were exonerated of any wrongdoing. Not one was even disciplined. In fact, in the weeks following the shooting they were each given the Meritorious Service award from the police officer’s union. But it is not sharing a town with his son’s killer that keeps Bell up at night. He told TFTP what bothers him the most is knowing that nationally, law enforcement agencies routinely exonerate themselves from wrongdoing without any outside agency accountability. The officers claim they did nothing wrong—even in cases where a gang of cops show up at a man’s home, without legitimate probable cause, escalate the use of force when a pair of handcuffs would suffice, and eventually assassinate the unarmed young man in his own driveway in front of his mom and sister. No one goes to jail, no one loses their jobs, and all end up getting medals for their work. Following the conversation with Gonzalez, Bell was successful in changing Wisconsin state law. He was instrumental in passing a law that made it illegal for law enforcement agencies to investigate themselves in cases where a suspect is killed by an officer. Now, an outside agency must take the lead in cases such as officer-involved shootings. Predictably, following the law’s passage, Bell has called for his son’s case to be reopened. Neither the district attorney, the city council, nor the mayor have supported such an investigation. Bell’s plight for transparency has recently made national headlines with stories being run on almost every major network, as well as many international outlets. To this day, an inquest into his son’s shooting has not been granted by the City of Kenosha, and Bell has pledged to continue in his fight for justice.